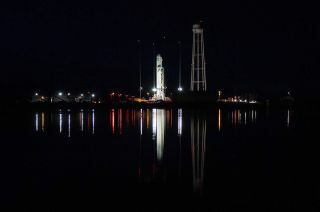 The Northrop Grumman Antares rocket sits with the Cygnus spacecraft on Pad-0A at NASA's Wallops Flight Facility in Virginia. On Saturday (Nov. 17) at 4:01 a.m. EST (0901 GMT), Northrop Grumman's Antares rocket will launch the Cygnus cargo spacecraft to the International Space Station as part of Northrop Grumman's NG-10 mission. The cargo spacecraft will carry approximately 7,400 pounds of food, clothing, equipment and scientific experiments to the space station. Northrop Grumman's Antares rocket will launch with the spacecraft from Pad-0A at Virginia Space's Mid-Atlantic Regional Spaceport at NASA's Wallops Flight Facility in Virginia. You can watch the launch live here on Space.com starting at 3:30 a.m. EST (0830 GMT), courtesy of NASA TV. The Northrop Grumman Antares rocket launch will be visible along the eastern coast of the United States. The launch was originally scheduled for the morning of Thursday Nov. 15, but inclement weather pushed the launch to Friday morning, and then to Saturday. As of this morning (Nov. 16), officials have indicated that weather conditions look good for Saturday morning, with a less than 5 percent chance of weather-related concern, and that the launch is on track. The Cygnus spacecraft is set to arrive at the space station Monday (Nov. 19), the day after a Russian Progress cargo spacecraft docks with the station. Astronauts will grapple the approaching Cygnus and berth it with the space station. Then, the work will begin unloading the crucial cargo. The spacecraft is set to stay at the station for three months, according to officials, and after it detaches from the station it will deploy cubesats and complete other missions before returning to Earth and burning up above the South Pacific ocean.